Disney Donna Kay: Disney Party Board - Monsters Inc.
Disney Party Board - Monsters Inc.
Mike and Sully are a couple of monsters that are cute enough to plan a whole party theme around, and we mustn't forget about precious little "Boo!" Decor should be focused on the colors lime green, purple, and turquoise. Blow up green balloons and attach a big eyeball so they can resemble Mike Wazowski! You could also make your own doors and hang them up or post them all over the walls for that special "Monsters, Inc." touch. Do you remember the scream canisters in the movie?! - get some Pringles cans and yellow cardstock and go to town. You could fill the cans with all sorts of goodies for party favors! Pin the eye on Mike is a fun activity for the little monsters in attendance. For food, have some fun. 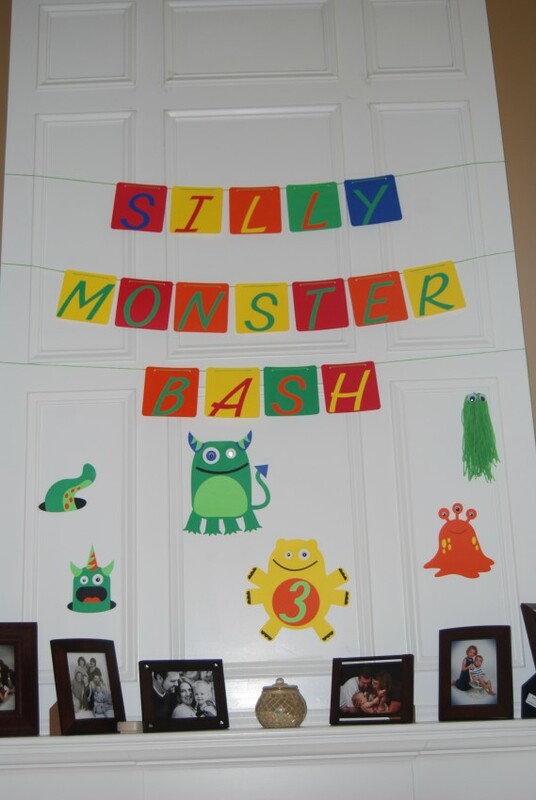 You can monster-it-up with all sorts of creepy touches or go with the more fun colorful monsters. 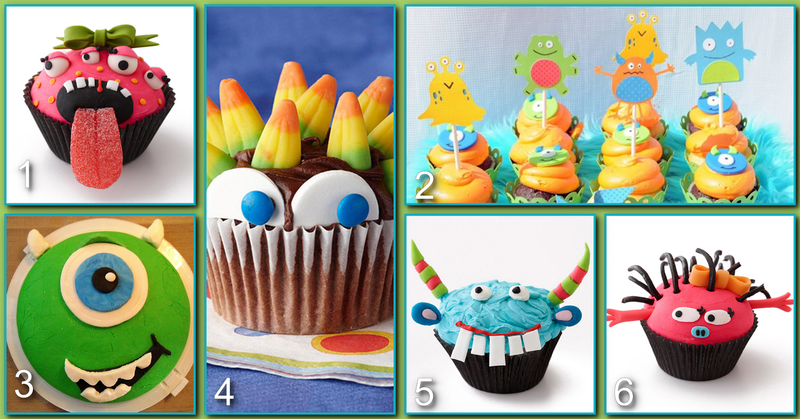 The attendees could design their own cupcakes (adding eyes/sprinkles/icing) as a design your very own monster activity! Monster Mural - What a great activity for the kids, just put the mural on the wall and let them color the monsters in with markers (washable of course). Monster Foot Prints - Whether your party is indoors or out place monster foot prints leading the way to all the monstrous fun!! Monster's Inc. Cake - Love the nod to Sully and Mike and they didn't forget Boo, she sits atop the adorable cake. Monster Cake Pops - These adorable guys are from an alien party, but don't they just fit in with the Monster's Inc. guys perfectly? Sully Wreath - I think the wreath is my favorite thing on the whole board!! The fur is so close to Sully, you could easily add some purple dots instead of the eyes if you wanted to be true to the movie, you would even add horns!! Pin the Eye on Mike - Be sure to have a prize for the person who gets closest to Mike's correct eye socket. Cupcakes & Cups - Don't you just love the eyes on the cups! These monster cupcakes are frightfully cute!! Monster ID Badges - Make the kids feel like they are a part of the Scare Floor in Monstropolis with these great Monster's Inc. ID badges! Dessert Table - This dessert table is so cute, complete with monster treats and a cute Happy Birthday Pennant Banner. Monster Pumpkin - This green monster pumpkin is so cute he would be better at collecting laughs than screams!! Monster Masks - Have the kids decorate their own Monster Mask to wear at the party - a really fun activity and they can take them home as a party favor too!! Monster Bubbles - Another great idea as a party favor, use monster bubble wands in colors coordinating with the party. Monster Marshmallows - Colored sanding sugar and edible eyes come together to make these some of the cutest marshmallows I have ever seen!! Monster Hats - There's not a kid on this side of the closet door who would not look adorable in these hats!! Balloons - These green balloons are just the color to match Mike don't you think, add some blue and orange ones and you are ready to party. Monster Place Setting - A one eyed bowl with matching napkin ring make this one of my favorite place setting ever! And the chevron napkin and place mat are the perfect accessory!! 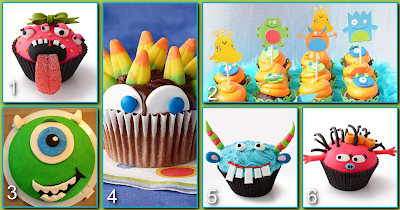 There are so many great cupcake ideas for monsters!! Just check out Pinterest if you don't believe me. Be sure to have edible eyes and lots of candy so the kids can create their own cupcake monster. Make a few examples and have them on the table as inspiration for the kids. Green Bow Monster - Who says a monster can't accessorize? The green bow and multiple eyes make this cupcake super adorable!! Monster Cupcake Toppers - For the really young kids to be part of the fun have cute cardstock monsters on lollipop sticks ready to top off cupcakes with colorful icing. Mike Cupcakes - Have the fondant already cut out in these simple shapes for the kids to make Mike cupcakes. Spike - I'm not sure which I like better the candy corn spiked hair or the eyes peeking over the cupcake wrapper!! Very easy for the kids to put together too!! Blue Devil - Blue icing and striped fondant horns make this one of the cutest blue devil monsters you will ever see. Hot Pink Monster Mamma - She looks like she's ready to reach out a give a bug ole hug, doesn't she! Licorice hair and Sour Patch arms combined with bright pink icing make her one Hot Little Mamma!! One more fun activity for the kids, let them decorate a "closet" door, you can decorate it non-permanent table found on the scrapbook aisle. Use cardstock flowers to make it look like Boo's door or let the kids use their imagination to decorate a entryway for Monsters!! Hope you enjoyed this week's party!! A Monster's Inc. theme would be great for Halloween too!! Some really great ideas here. A Monsters Inc party would be so much fun!! Thanks Lucinda!! I think we are going to have to have one of those cute hats for Ashley's baby boy at Halloween!!! Your boards are amazing- how long does it take you to research each one??! Pin the Eye on Sully- it doesn't get better than that!! Thanks D!! Ashley and I pin things we like on Pinterest all along. It takes a while to research where some of the pics come from since everyone doesn't pin from the original site. I want to be sure the proper person is getting credit for their ideas. We are already getting things together for next week, Ratatouille probably. I love the "Pin the Eye" game too. I wouldn't have thought of that on my own. 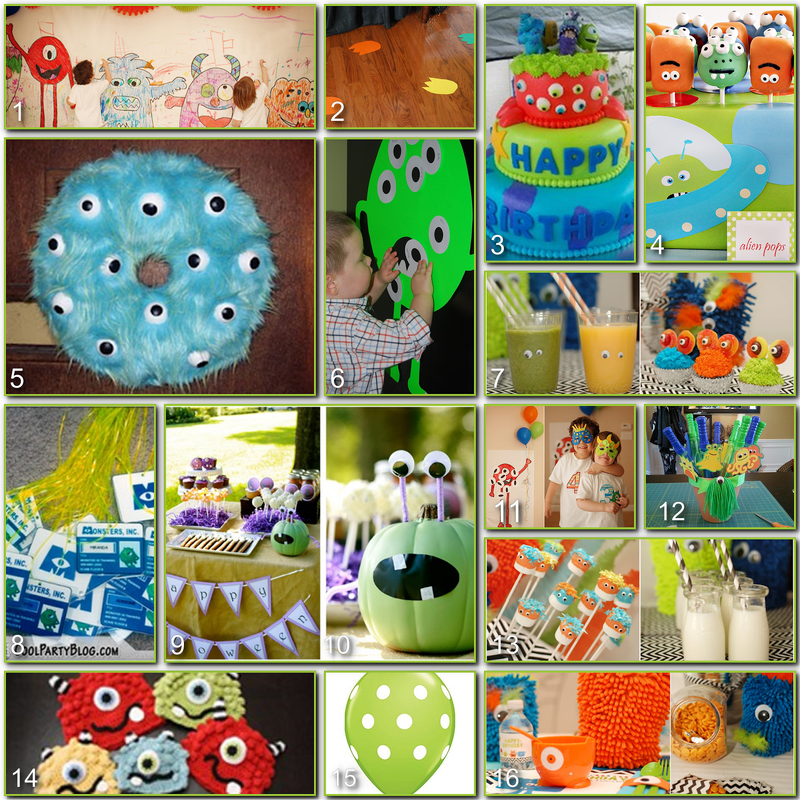 I am doing a Monster University party for my son, he is turning two! However I have no creativity do you know of any healthy Monster snacks I could use at his party?